Established in the U.K. in 1973 and branching out to the U.S. in 1998, Karndean International has evolved into one of the world's best known and most respected flooring brands. With a strong dedication to product research and development, the company is committed to producing imaginative, innovative and affordable design flooring products characterized by industry-leading quality and durability. Karndean's luxury vinyl tile flooring is virtually indistinguishable from the natural materials that inspire its designs, yet provides significant advantages in terms of design capability, durability, maintenance and hygiene. Whether you choose a wood, marble or slate visual, Karndean flooring give you unmatched, natural realism both in design and texture. And, with a Karndean luxury vinyl floor you won't have to worry about chipping, splintering or cracking like with real wood or slate. Endless Design Choices: With a vast array of planks, tiles and design components, Karndean floors allow homeowners to express their individual tastes. Create your own unique design with vinyl borders, feature strips, design strips, and medallions which match perfectly with Karndean's tiles and plank flooring. 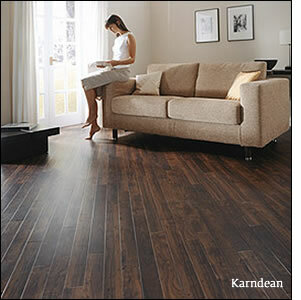 Durability: Karndean's luxury vinyl tile flooring is extremely hard-wearing. The same flooring Karndean provides to residential consumers is also installed throughout the world in some of the most demanding commercial flooring environments. Maintenance: Karndean LVT flooring requires minimal maintenance and is easily cleaned, which makes it a great choice for busy homeowners. Hygiene: Unlike many flooring options, Karndean luxury vinyl tile will not harbor dirt and bacteria, making it a smart option for families with children and pets. Flooring retailers and contractors find significant advantages when installing a Karndean floor. The time and ease of installation a Karndean floor requires, especially when compared to natural options, further cements Karndean as a product of value to the flooring industry at-large. Karndean luxury vinyl tile flooring can be used anywhere in the home. Karndean International is a leading supplier of luxury vinyl tile flooring (LVT) worldwide. With such distinction comes responsibility. As such, Karndean is committed to the continual improvement of its manufacturing and logistical processes to ensure sustainability and best value for our customers and stakeholders, alike. Karndean prides itself on environmental awareness in the supply and maintenance of all of its products worldwide and is fully aware of its duty to perpetually monitor and reduce its environmental footprint. Karndean is a member of the United States Green Building Council. All Karndean products qualify for Leadership in Energy and Environmental Design (LEED) points in the USA. Karndean products carry a low Volatile Organic Compounds (VOC) test certificate from the U.S. Greenguard Environmental Institute and meet the 'for use with Children and Schools' standard, specifically LEED Credit 4.3 and CAL 1350. All Karndean products are manufactured in factories certified to the ISO 14001 environmental standard and ISO 9001 quality standard. Karndean flooring can be viewed across the USA through its network of preferred flooring retail stores. Additionally, Karndean International operates two national showrooms at its Pittsburgh and Las Vegas locations.